The GE Lab Freezer Refrigerator Combo Unit offers your lab flexibility in general purpose sample storage, and is ideal for everyday use. This lab refrigerator and freezer has an easy to use single mechanical thermostat, with adjustable shelving, ample in door storage, and a pull-out drawer at the base. This 12-cu ft capacity cold lab storage unit is split between a 9.25 cu ft refrigerator area and 2.8 cu ft of freezer space. The doors of this lab refrigerator freezer combo unit are reversible, and for optimal performance a clearance of 2” at the top, 1” in the back, and 1.5 “at the sides should be observed. 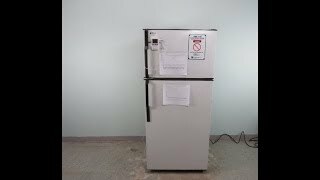 These GE Lab Freezer Refrigerator Combo Unit TB15SPER have been fully inspected and each section reached it's lowest temperatures. All of our lab equipment comes backed with our standard warranty. Should you have any questions, please don't hesitate to contact us.